Hey! Thanks for checking into how we could work together. Career Geek blog is a leading careers blog. We work with agencies and businesses to create and share content that resonates with a young audience of 16 – 25. Content Marketing is a great way to build your brand’s reputation. Please email us at hello@careergeekblog.com for a quote. You can share a guest post on our site. The post has to offer valuable advice on employment or entrepreneurship to the user. 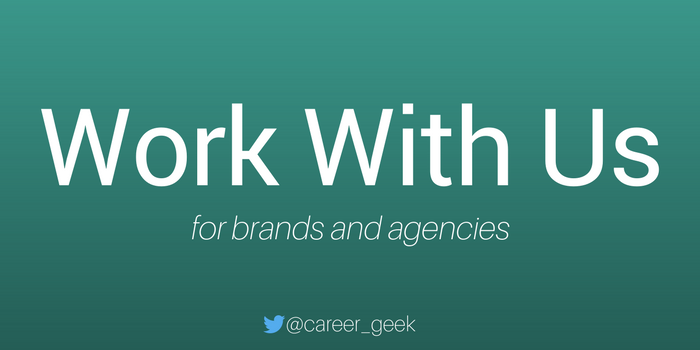 To discuss advertising opportunities on Career Geek or work with us on creating a targetted campaign for your brand, please email us on hello@careergeekblog.com. PLEASE NOTE: We do not offer free guest posts or create content for free for brands and agencies.